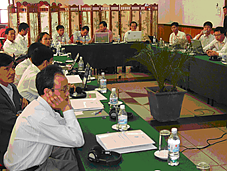 Bureau Leeters was involved in the curriculum development process at 2 agricultural universities in Vietnam: Hanoi University of Agriculture in Hanoi and Nong Lam University of Agriculture and Forestry in Ho Chi Minh City. Both curricula are horticulture orientated. Bureau Leeters' 'on site' and 'on distance' consultancy was part of the project Profession Oriented Higher Education (POHE). A priority in this project was matchmaking between the universities and the private and public sector in the agribusiness environment. The Vietnamese economy and social environment are fundamentally changing. In order to meet the demands of the labor market, institutes for higher education need to re-define their curricula towards its professional practice. The Dutch government supported these changes with the project Profession Oriented Higher Education (POHE), in which 8 selected universities received assistance to develop and deliver new profession oriented curricula during the period 2005-2009 and after. The project supported lecturers to teach, assess and evaluate these new curricula and to establish relationships with the labor market.